Google Sports Scores & "Take Me Out To The Ball Game!" And during one of these trips – and I’m not sure why I did it – but I Google’d the word “eagles”. I guess I had that word on my mind since I was watching the game. But as soon as I searched the word “eagles”, I saw something I’d never seen before! That is what’s called Google Sports Scores! But last night, you would have seen the same score box at the top of the search results with an up to the second score summary of the game. So basically to see scores and schedules for sports teams type the team name or league name into the search box, hit “search” and bam… there ya’ go! This is cool little search function that I’ve never used before, and so of course I never realized was available until last night. 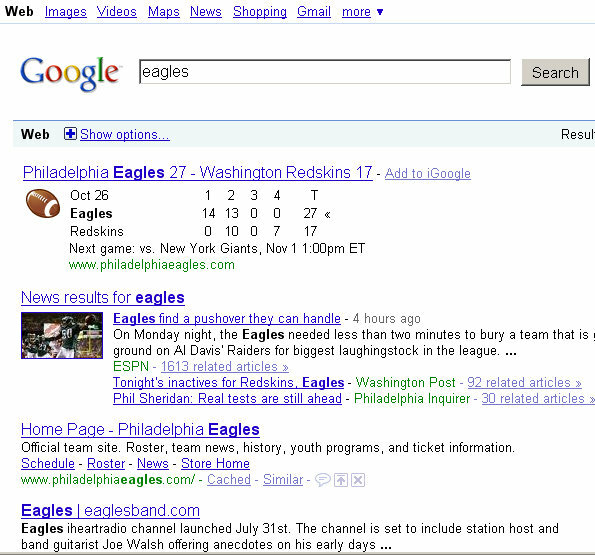 I think it’s awesome though, and just another small way that Google delivers relevant search results.